Everyone has wanted a late-night snack at some point in their lives. I know I have, but I've always worried about two things when having those cravings: the first worry is all the noise that making a late-night snack would make; the second worry is the whole calories thing that annoys us all. Eating a snack during the day isn't bad because you can just work off the calories through daily activities. Eating a snack at night, on the other hand, is kind of bad because you won't work off the calories. You would just normally go back to sleep, which turns those extra calories into stored sugar which becomes extra pounds, if I remember that whole cycle correctly. 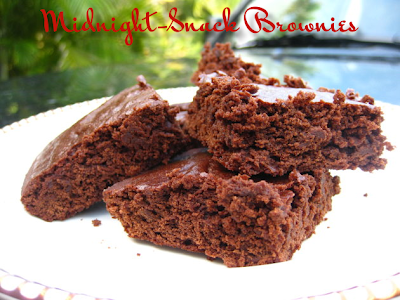 This is where these Midnight-Snack Brownies come in handy. According to Good Housekeeping: Brownies!, "A few sneaky tricks make these dreamy mocha bars a lowfat reality. Using cocoa instead of solid chocolate makes a big difference. In addition, corn syrup replaces some of the fat, and egg whites take the place of whole eggs. A little butter in the batter ensures rich flavor." 1) Preheat oven to 350F. Grease 8" by 8" baking pan. In cup, dissolve espresso-coffee powder in hot water; set aside. 2) In large bowl, with wire whisk, mix the flour, cocoa, baking powder, and salt. 3) In 2-quart saucepan, melt butter over low heat. Remove from heat. Add sugar, corn syrup, vanilla, egg whites, and espresso mixture and whisk until blended. With heat-proof spatula or spoon, stir sugar mixture into flour mixture just until blended. Do not overmix. Pour batter into prepared pan. 4) Bake until toothpick inserted in center comes out almost clean, 18 to 22 minutes. Cool in pan on wire rack at least 1 hour. 5) When cool, cut into 4 strips, then cut each strip crosswise into 4 pieces. If brownies are difficult to cut, use knife dipped in hot water and dried, repeating as necessary.